The UW Power System Test Case Archive provides World Wide Web access to power system data (test cases). The site is maintained by Richard D. Christie, an Associate Professor at the University of Washington located in Seattle, Washington, USA. Send submissions, questions and requests to christie@ee.washington.edu. 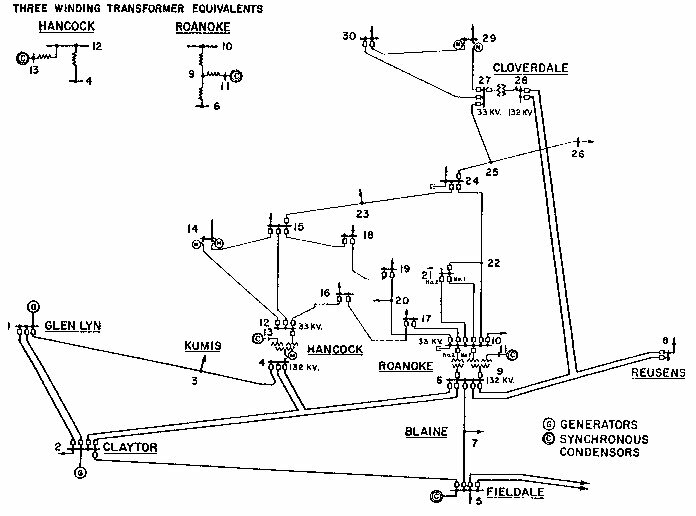 The IEEE 30 Bus Test Case represents a portion of the American Electric Power System (in the Midwestern US) as of December, 1961. The data was kindly provided by Iraj Dabbagchi of AEP and entered in IEEE Common Data Format by Rich Christie at the University of Washington in August 1993. Please call any typos to my attention. The line impedances were a bit hard to read on the (much Xeroxed) printed data and may be incorrect. The data has not been run through a power flow to check the answers. Caveat emptor! And please let me know of any corrections you find necessary. The 11 kV and 1.0 kV base voltages are my guess. The model actually has these buses at either 132 or 33 kV. The 30 bus test case does not have line limits!